Linear Regression is a supervised statistical technique where we try to estimate the dependent variable with a given set of independent variables. We assume the relationship to be linear and our dependent variable must be continuous in nature. 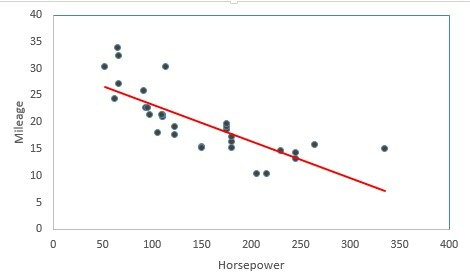 In the following diagram we can see that as horsepower increases mileage decreases thus we can think to fit linear regression. The red line is the fitted line of regression and the points denote the actual observations. The vertical distance between the points and the fitted line (line of best fit) are called errors. The main idea is to fit this line of regression by minimizing the sum of squares of these errors. This is also known as principle of least squares. Estimating the price (Y) of a house on the basis of its Area (X1), Number of bedrooms (X2), proximity to market (X3) etc. Estimating the mileage of a car (Y) on the basis of its displacement (X1), horsepower(X2), number of cylinders(X3), whether it is automatic or manual (X4) etc. To find the treatment cost or to predict the treatment cost on the basis of factors like age, weight, past medical history, or even if there are blood reports, we can use the information from the blood report. Simple Linear Regression Model: In this we try to predict the value of dependent variable (Y) with only one regressor or independent variable(X). Multiple Linear Regression Model: Here we try to predict the value of dependent variable (Y) with more than one regressor or independent variables. Here 'y' is the dependent variable to be estimated, and X are the independent variables and ε is the error term. There must be a linear relationship between the dependent and independent variables. Error terms are normally distributed with mean 0. No multicollinearity - When the independent variables in my model are highly linearly related then such a situation is called multicollinearity. Error terms are identically and independently distributed. (Independence means absence of autocorrelation). Error terms have constant variance i.e. there is no heteroscedasticity. No outliers are present in the data. It suggests the proportion of variation in Y which can be explained with the independent variables. Mathematically, it is the ratio of predicted values and observed values, i.e. If then R2 = 0 indicates a poor fit. Thus it lies between 0 and 1. If the value of R2 is 0.912 then this suggests that 91.2% of the variation in Y can be explained with the help of given explanatory variables in that model. In other words, it explains the proportion of variation in the dependent variable that is explained by the independent variables. On addition of a new variable the error is sure to decrease, thus R square always increases whenever a new variable is added to our model. This may not describe the importance of a variable. For eg. In a model determining the price of the house, suppose we had the variables GDP, Inflation rate, Area. If we add a new variable: no. of plane crashes (which is irrelevant) then still R square will increase. where k is the no. of regressors or predictors. Hence adjusted R square will always be less than or equal to R square. On addition of a variable then R square in numerator and 'k' in the denominator will increase. If the variable is actually useful then R square will increase by a large amount and 'k' in the denominator will be increased by 1. Thus the magnitude of increase in R square will compensate for increase in 'k'. On the other hand, if a variable is irrelevant then on its addition R square will not increase much and hence eventually adjusted R square will increase. Thus as a general thumb rule if adjusted R square increases when a new variable is added to the model, the variable should remain in the model. If the adjusted R square decreases when the new variable is added then the variable should not remain in the model. Why error terms should be normally distributed? For parameter estimate (i.e. estimating the βi’s) we don't need that assumption. But, if it is not a normal distribution, some of those hypotheses tests which we will be doing as part of diagnostics may not be valid. For example: To check whether the Beta (the regression coefficient) is significant or not, I'll do a T-test. So, if my error is not a normal distribution, then the statistic I derive may not be a T-distribution. So, my diagnostic test or hypotheses test is not valid. Similarly, F-test for linear regression which checks whether any of the independent variables in a multiple linear regression model are significant will be not be viable. Why is expectation of error always zero? The error term is the deviation between observed points and the fitted line. The observed points will be above and below the fitted line, so if I took the average of all the deviations, it should be 0 or near 0. Zero conditional mean is there which says that there are both negative and positive errors which cancel out on an average. This helps us to estimate dependent variable precisely. Why multicollinearity is a problem? If my Xi’s are highly correlated then |X’X| will be close to 0 and hence inverse of (X’X) will not exist or will be indefinitely large. Mathematically, which will be indefinitely large in presence of multicollinearity. Long story in short, multicollinearity increases the estimate of standard error of regression coefficients which makes some variables statistically insignificant when they should be significant. How can you detect multicollinearity? 1. Bunch Map Analysis: By plotting scatter plots between various Xi’ s we can have a visual description of how the variables are related. 2. Correlation Method: By calculating the correlation coefficients between the variables we can get to know about the extent of multicollinearity in the data. 3. VIF (Variance Inflation Factor) Method: Firstly we fit a model with all the variables and then calculate the variance inflation factor (VIF) for each variable. VIF measures how much the variance of an estimated regression coefficient increases if your predictors are correlated. The higher the value of VIF for ith regressor, the more it is highly correlated to other variables. So what is Variance Inflation Factor? Variance inflation factor (VIF) for an explanatory variable is given 1/(1-R^2 ) . Here, we take that particular X as response variable and all other explanatory variables as independent variables. So, we run a regression between one of those explanatory variables with remaining explanatory variables. Graphical Method: Firstly do the regression analysis and then plot the error terms against the predicted values( Yi^). If there is a definite pattern (like linear or quadratic or funnel shaped) obtained from the scatter plot then heteroscedasticity is present. Goldfeld Quandt (GQ)Test: It assumes that heteroscedastic variance σi2 is positively related to one of the explanatory variables And errors are assumed to be normal. Thus if heteroscedasticity is present then the variance would be high for large values of X.
Order/ rank (ascending) the observations according to the value of Xi beginning with the lowest X value. Omit ‘c’ central observations and divide the remaining (n-c) observations into 2 groups of (n-c)/2 observations each. Fit separate OLS regression to both the groups and obtain residual sum of squares (RSS1 and RSS2) for both the groups. It follows F with ((n-c)/2-k) d.f. both both numerator and denominator. Where k is the no. of parameters to be estimated including the intercept. If errors are homoscedastic then the two variances RSS2 and RSS1 turn out to be equal i. e. F will tend to 1. Numpy, pandas and matplotlib.pyplot are imported with aliases np, pd and plt respectively. Using sklearn we split 80% of our data into training set and rest in test set. Setting random_state will give the same training and test set everytime on running the code. Using sklearn linear regression can be carried out using LinearRegression( ) class. sklearn automatically adds an intercept term to our model. Errors are the difference between observed and predicted values. It is to be noted that statsmodels does not add intercept term automatically thus we need to create an intercept to our model. No. Observations:                 824   AIC:                             6199. Df Residuals:                     815   BIC:                             6241. Note that both y_pred and y_pred2 are same. It's just these are calculated via different packages. We can also calculate r-squared and adjusted r-squared via formula without using any package. Firstly we try to get the studentized residuals using get_influence( ). The studentized residuals are saved in resid_student. Using the drop( ) function we remove the outlier from our training sets! We create a function to remove the collinear variables. We choose a threshold of 5 which means if VIF is more than 5 for a particular variable then that variable will be removed. Removing the variables from the test set. No. Observations:                 823   AIC:                             6270. Df Residuals:                     817   BIC:                             6298. Checking normality of residuals We use Shapiro Wilk test from scipy library to check the normality of residuals. Null Hypothesis: The residuals are normally distributed. Alternative Hypothesis: The residuals are not normally distributed. Since the pvalue is 0.6269 thus at 5% level of significance we can say that the residuals are normally distributed. Checking for autocorrelation To ensure the absence of autocorrelation we use Ljungbox test. Null Hypothesis: Autocorrelation is absent. Alternative Hypothesis: Autocorrelation is present. Since p-value is 0.1602 thus we can accept the null hypothesis and can say that autocorrelation is absent. Checking heteroscedasticity Using Goldfeld Quandt we test for heteroscedasticity. Alternative Hypothesis: Error terms are heteroscedastic. The p-value is 0.539 hence we can say that the residuals have constant variance. Hence we can say that all the assumptions of our linear regression model are satisfied. 6 Responses to "Linear Regression in Python"
How to download the data used in this article? The download link has been added. Thanks! Data Science and R course includes Python and R both?. I am in search of course where I want to learn both languages. I have replied back on your email address. Thanks! I tried to apply your formulas on the data, but I noticed that after removing multicollinearity columns then I tried OLS again, multicollinearit didn't remove. Did you notice?